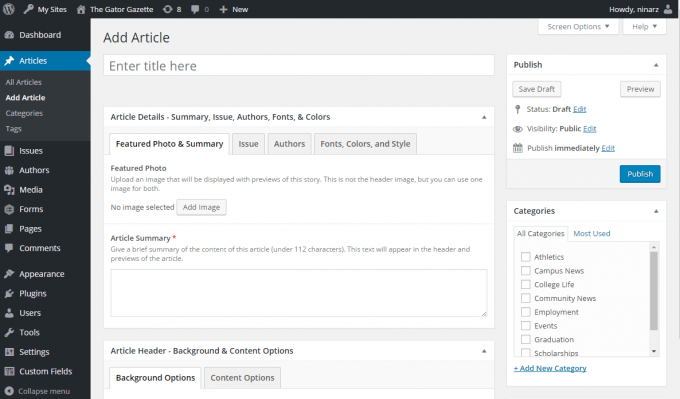 Articles function similarly to Posts for WordPress websites; they can be added to specific categories. However, an article’s main purpose is to provide content to the reader. With Chronos, articles have a number of components and settings that allow you to finely tune how that content is presented. To create a new Article, click on Articles in the Dashboard navigation menu on the left side and choose Add Article. Give your article a Title by typing the title into the box that says, “Enter title here.” This is the title your readers will see. 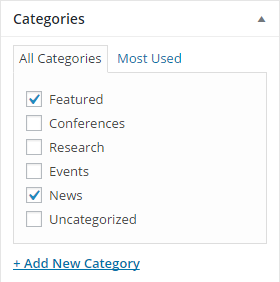 Articles can be added to Categories. Using the category functionality, you can display the articles of a particular category as part of a section on your front page. Articles are not used for navigation menus and do not have a parent/child hierarchical structure.